19There was a certain rich man, which was clothed in purple and fine linen, and fared sumptuously every day: 20And there was a certain beggar named Lazarus, which was laid at his gate, full of sores, 21And desiring to be fed with the crumbs which fell from the rich man’s table: moreover the dogs came and licked his sores.22And it came to pass, that the beggar died, and was carried by the angels into Abraham’s bosom: the rich man also died, and was buried;23And in hell he lift up his eyes, being in torments, and seeth Abraham afar off, and Lazarus in his bosom.24And he cried and said, Father Abraham, have mercy on me, and send Lazarus, that he may dip the tip of his finger in water, and cool my tongue; for I am tormented in this flame.25But Abraham said, Son, remember that thou in thy lifetime receivedst thy good things, and likewise Lazarus evil things: but now he is comforted, and thou art tormented.26And beside all this, between us and you there is a great gulf fixed: so that they which would pass from hence to you cannot; neither can they pass to us, that would come from thence.27Then he said, I pray thee therefore, father, that thou wouldest send him to my father’s house:28For I have five brethren; that he may testify unto them, lest they also come into this place of torment.29Abraham saith unto him, They have Moses and the prophets; let them hear them.30And he said, Nay, father Abraham: but if one went unto them from the dead, they will repent.31And he said unto him, If they hear not Moses and the prophets, neither will they be persuaded, though one rose from the dead. This is a parable that Jesus told us. All what we know about hell, we know it from Jesus. And if we read the gospel we will be surprised that Jesus has spoke more about hell than heaven. Well it is not to frighten them but to warn them. One thing we know for sure is that heaven is a reality, if so then Hell is also a reality. Well after going through these scriptures, i very much longed to ask Jesus this one question. What was that terrible sin the rich man did that he ended up in hell. I really wanted to know. Well the reason why i need to know the mistake that the rich man had committed is because i do not want to commit the same mistake what he had done. Yes i really want to know so that i can refrain from the same mistake which he had committed. Well i know now that many of you want to know that too. Let us go to each verse from 19 to 31. Verse 19 says that he was rich. Well i do not believe that being rich would be a reason to be in hell. 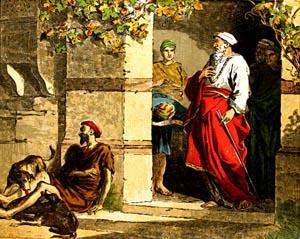 Even though the Bible says it is difficult for a rich man to enter heaven, the Bible also tells us that God made Abraham rich, and he blessed Job with riches, and he blessed Solomon with riches. Riches can be blessing when u become rich righteously and you give God according to what the Bible commands. So let me tell you it is not because he was rich that he went to hell. Now the Bible again tell us that he was clothed in purple and fine linen. Well may be he was very fashionable. May be he loved to wear beautiful clothes every day and he had a fine collection of clothes. Well now again i don’t think this was a reason why we would end up in hell. Lets read on further. We understand that the rich man had plenty of food, because the poor man lazarus knew he could get something that would fall from his table. May be he had eaten a lot. Maybe he wasted a lot. But still i don’t find it convincing to believe that he went to hell because he ate much food or he ate the best food. Now let us move out of the palace. Here we see the poor man lazarus. He was in a very terrible condition. he had sores all around his body. The Scriptures very clearly says that dogs licked from his sores. If you can visualize that in you mind, now you know what state he was in. Well he was indeed suffering day and night. Scripture says he was at the gate of the rich man. The Bible never said that the poor man said his daily prayers or the bible never mentioned he praised God amist his troubles. Well we find no reason why the poor man went to heaven or Abraham’s Bosom in the word. Having read all what i have written above, i am sure by now u really want to know the terrible sin that he had commited. I too want you to know what that was. Before that let me tell you one thing. I couldn’t find a single mistake from the rich man by his life style and by what he did. Nor did i find a good thing that the poor man has done to be in heaven. Well dear brothers and sisters, it is not that he did a bad thing, that he ended up in hell, But it is the good things that he din’t do that got him there in hell. Yes many of us live a life not hurting others, not being a trouble for others, not bothering others. You believe you live a good life because you stay away from others. Remember what Jesus said to us, “Depart from me, ye cursed, into everlasting fire, prepared for the devil and his angels, For I was an hungred, and ye gave me no meat: I was thirsty, and ye gave me no drink, I was a stranger, and ye took me not in: naked, and ye clothed me not: sick, and in prison, and ye visited me not.” Well if this is the case then how many of us would be condemned. I think the Rich man was too kind enough to let the poor man lie near his gate as people nowadays would not even bother to allow a man of this agony anywhere near by. Dear Brothers and Sisters, living a life not troubling others alone won’t help you attain eternity. But to live a life what Jesus wants us to live would indeed help us inherit the Kingdom prepared for us from the foundation of the world. May God Open your minds to Understand the Scriptures and help you live the way he wants us to live. This entry was posted in General and tagged Jesus raises Lazarus, parable of the rich man, rich man in hell, The death of Lazarus, The raising of Lazarus, The rich man and Lazarus. Bookmark the permalink.